Dalal Street magazine is a widely read magazine; though it do provide conflicting signals within its own magazine and sister publications. 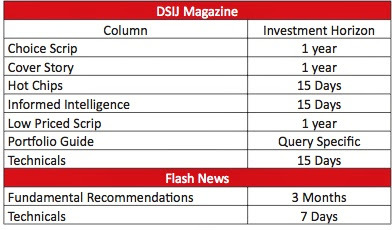 However one must be aware of the time frame for which a stock is recommended in Dalal Street magazine as we do not want you to be struck in any stock. You can check our hot stock of the day for your intraday tips to have quick solid gains in first 2 hours of the market opening.